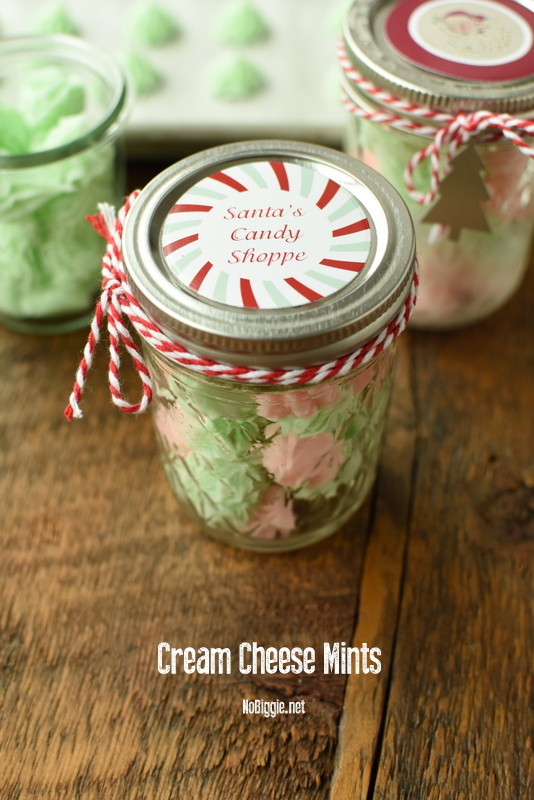 Easy Cream Cheese Mints make sweet gifts during the holidays and fun party treats. Please tell me you’ve had cream cheese mints? They’re so good! Not only are they delicious, they also make adorable gifts during the holidays. Super easy to whip up (only 4 ingredients!). This recipe makes hundreds, so you can have plenty to give and some to keep, or serve them at your next holiday party. We made pink and green mints, but you really can do any color and any shape too. 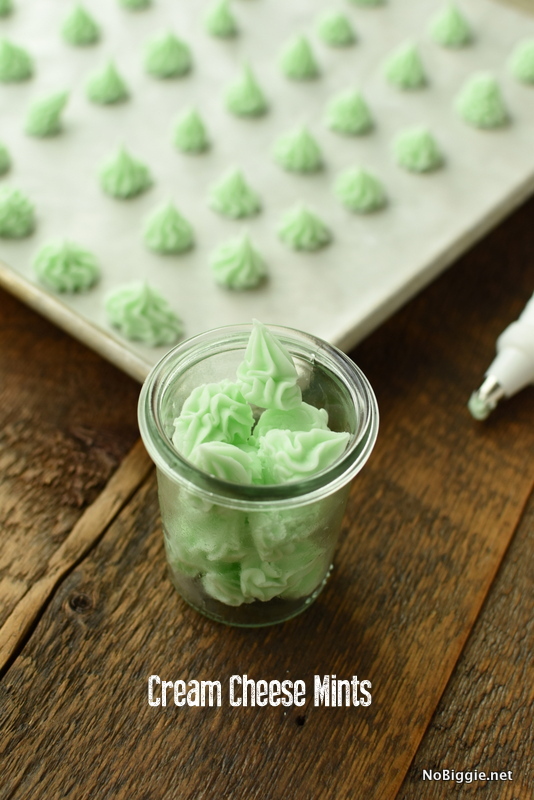 We used a piping bag and frosting tip for these, but they also make so many cute mint molds for different shapes and designs, so you can really get creative. One of my favorite things are precut parchment sheets. I love how they fit perfectly into a big sheet pan. Parchment is a must for these mints. They make it so they don’t stick at all. 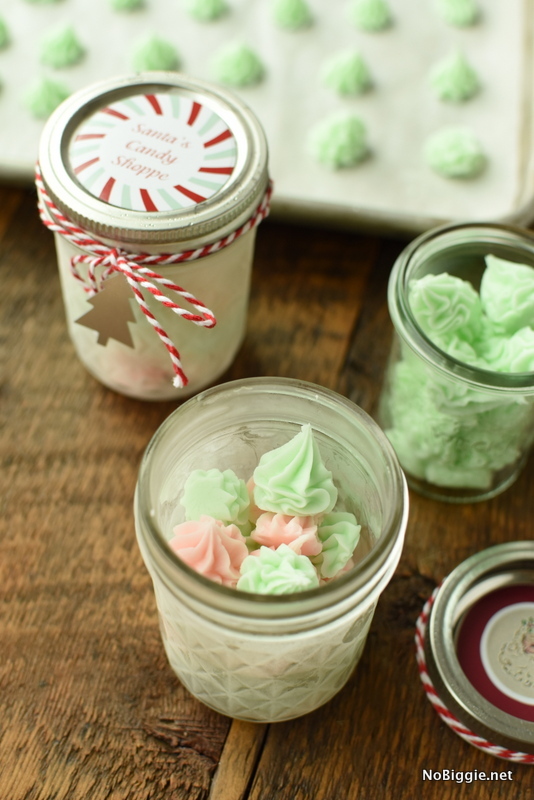 To go with these yummy mints, we have these adorable holiday gift tags that fit perfect on top of small mason jars. 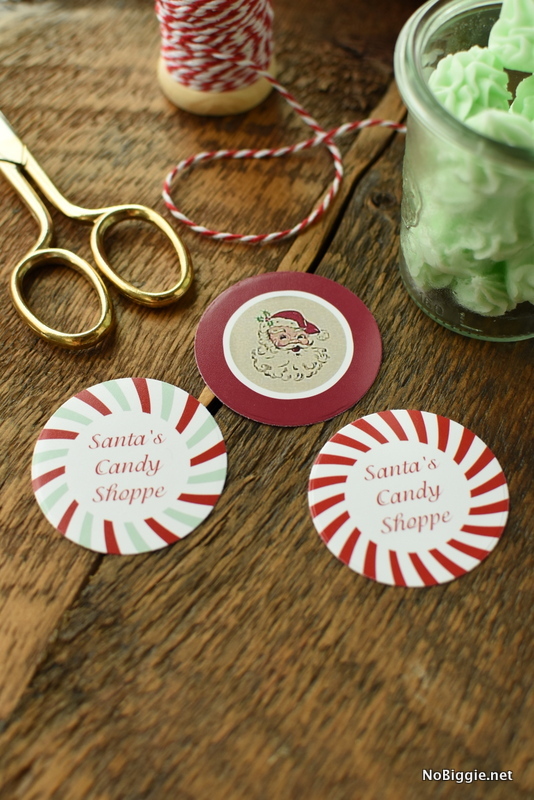 These gift tags are a free printable we shared a few years ago. 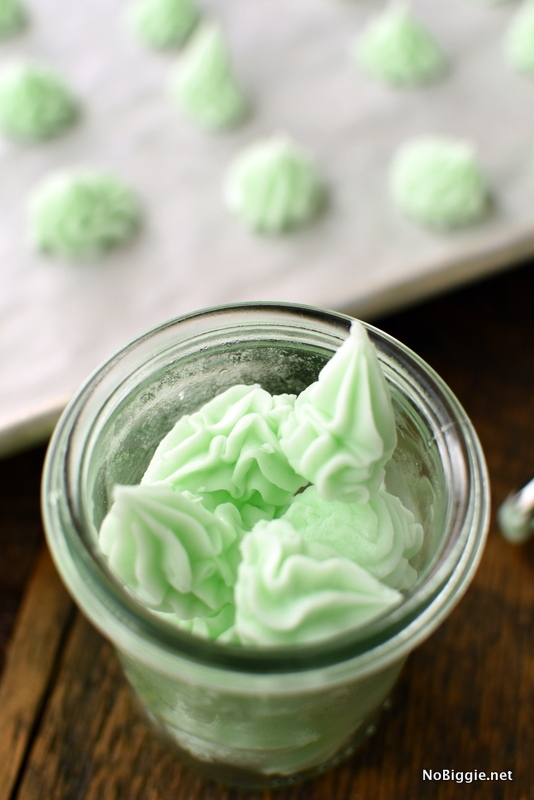 We made a quick video so you can see just how easy it is to make these yummy mints. Slowly add the powdered sugar until thick. The mixture should be stiff enough to hold a peak. 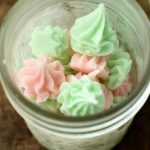 If you plan to make a few different colors of mints, divide the cream cheese into two separate bowls before adding the food coloring. Green mints need about 3 drops of green food coloring, and pink mints need about 1 drop of red food coloring. Add the food coloring to the cream cheese mixture and mix until the desired color is reached. Put the cream cheese mixture into a piping bag fitted with a medium star tip and make about nickel sized amounts on the parchment lined sheet pans. To make this style shape, hold the frosting tip 1/2-inch above the baking sheet, squeeze the bag until about a nickel size is on the pan, and then pull up quickly. Place sheet pan in the freezer for 2 hours to allow the mints to firm up. Store in an airtight container in the refrigerator, and enjoy! Super easy, and a great make ahead holiday treat your friends and family will love! *Amazon affiliate links in this post. Only sharing things we truly love and hope you will too.